The Kerwee Feedlot hosted Australia’s premier lot feeding conference for the Australian Lot Feeders Association (ALFA) on 23rd – 24th October. 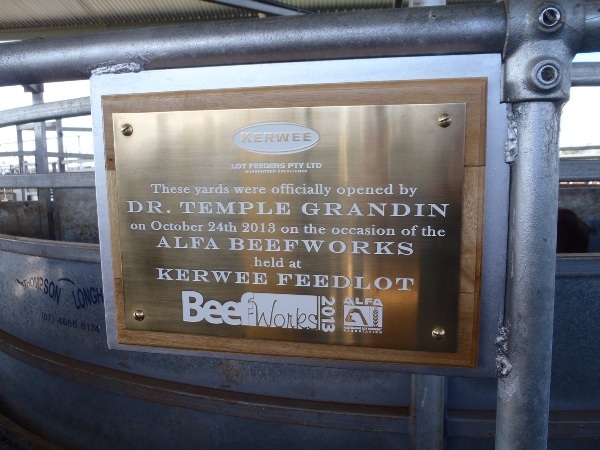 Internationally renowned animal behaviourist Dr Temple Grandin opened the conference, as well as conducting a number of practical sessions in the new Kerwee cattle handling facility. Temple is well recoginsed for her understanding of animal behaviour and her contribution to worlds best practise in safe and humane handling from farm gate to processing facility. During Beefworks, Dr Grandin opened the new Kerwee Thompson Longhorn Cattle Handling Facility. The new facility represents the significant investment that Kerwee Group has made to ensure our cattle are handled with the upmost care and respect. Safe, low stress handling practises through a modern efficient facility contribute to a much better beef outcome. The yards are designed to keep cattle clean and promote a hygienic environment, which extends all the way to processing.